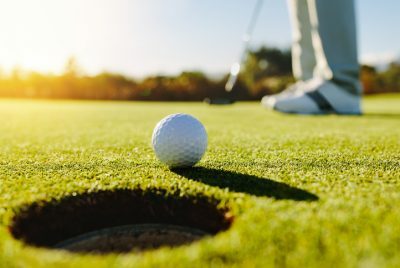 With golf’s Ryder Cup only a week away, University of Lynchburg physics professor Dr. John Eric Goff explained the science of the perfect swing and other aspects of the game on a new StarTalk Playing with Science podcast. Dr. Goff, a frequent guest on the show, talked about how humidity levels and types of grass impact the game, how wind impacts the game, why golfers work on their flexibility in preparation for driving a ball long distances, and more. He also mentioned Carter Old ’20, one of his University of Lynchburg students who is majoring physics and plays on the men’s golf team. They worked together to research details about the Albatros course in Paris, France, where the Ryder Cup will be played, and think about the physics implications. “We had a lot of fun breaking this course down,” Dr. Goff said. He was followed by a psychologist who specializes in the mental side of golf. Listen to the episode, Golf’s 2018 Ryder Cup: Physics and Psychology at the Albatros, on startalkradio.net or most popular podcast networks. Playing with Science is part of astrophysicist Neal de Grasse Tyson’s StarTalk radio network. It’s focused on the science of sports and Dr. Goff, an internationally recognized expert on the physics of cycling, soccer, tennis, and other sports, has appeared on more than a dozen episodes in the past two years. He frequently involves students in his research, especially when he studies the physics of the Tour de France. In October, Dr. Goff will travel to Marshall University in Huntington, West Virginia, to give two talks about the physics of sports.